These resources relate to improving care for people with pre-existing or long term illness, including Chronic Obstructive Pulmonary Disease and Hypertension, recognising that people with these diseases often have multimorbidities such as depression, arthritis and dementia. An overview of the process to use the Chronic Disease Management Program Self Assessment Tool to implement the Service Model. The Service Model describes the CDMP’s core principles, elements and resources. The Self-Assessment Tool is intended to assess the delivery of the program against the Service Model. The CDMP provides care coordination and self-management support to help people with chronic disease better manage their condition and access appropriate services in order to improve health outcomes, prevent complications and reduce the need for hospitalisation. The Agency for Clinical Innovation (ACI) has been commissioned to lead the implementation of two streams of the NSW Integrated Care Strategy - Risk Stratification and Patient Reported Outcomes/Experience Measures. Risk stratification approaches support a focus on organising care to meet the needs of targeted patients and their carers, rather than organising services around provider structures. Early identification and selection of people at risk of poorer patient health outcomes will enable the provision of appropriate integrated care interventions and mitigation strategies. This Action areas for consideration by ACI Networks document aims to support ACI Networks to deliver and/or enhance current and developing models of care to improve outcomes for people with neurodegenerative and neuromuscular conditions. It should be read in conjunction with the Diagnostic report. This Diagnostic report draws together information about care and service issues for people affected by neurodegenerative (ND) and neuromuscular (NM) conditions in NSW. This page includes the guide and tempaltes to show how LHDs and PHNs can use focus groups to collect information about the participant experience with the ultimate aim of improving services. This guide shows how LHDs and PHNs can use focus groups to collect information about the participant experience with the ultimate aim of improving services. This collection of patient story videos highlights the importance of self-management and coordinated care to support people living with chronic conditions. Ruth Hussey presentation on improving healthcare, especially improving outcomes and addressing the role that poverty can play in creating ill health. This evidence check is part of the development process of a framework for consumers to participate in the management of their healthcare and ongoing treatment decisions. A diagram identifying the core components for chronic conditions rehabilitation and their linkages. 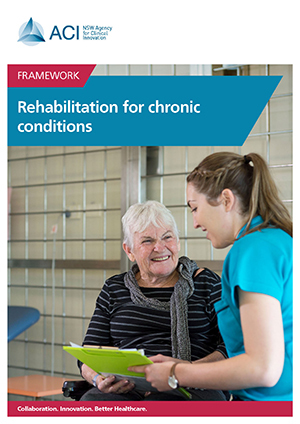 An optional Rehabilitation for Chronic Conditions Framework resource that may be adapted to suit individual services or programs.